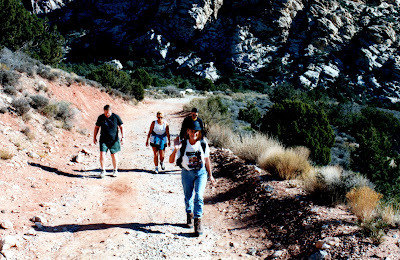 Over the years when ever we ended up in Las Vegas often on business it became a tradition to find a new hike. 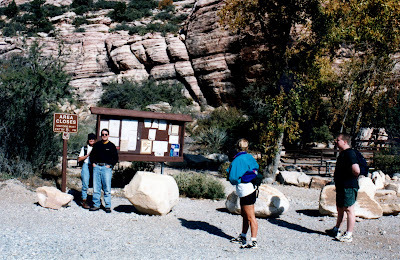 Sometimes if there were others involved from the business they asked if they could come along on the hikes. 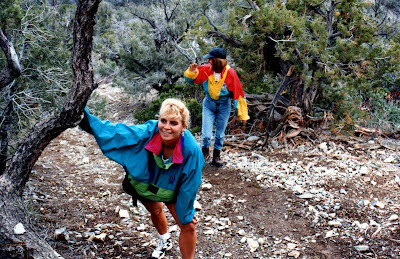 One the occasion of a hike we planned along the ridge across the top of several peaks in the Spring Mountain Range near Red Rock canyon we gathered a crowed. While the crowed didn’t have much experience in the mountains this was going to be a fairly easy trail. Part of the way the trail follows an old 4 wheel drive track so even through it was long 6 or 7 miles round trip it wasn’t to steep and it was wide. It was a good trail for first timers. So early on a Sunday morning Rich an old hiking partner ( you have seen Rich in other hikes) Margaret and I stopped at a grocery store picked up lunch (and of course a bottle of wine for the summit), then we picked up our crowed and headed for the trailhead. It was a cool day but the sun was shining nicely as we headed off up the old Jeep trail towards the summit. The old jeep trail was easy walking and wound its way around to the back side of the summit for a couple of miles before it started a switchback assent. 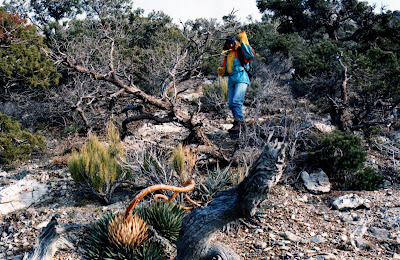 The assent wound its way through a scrub pine dessert area working its way steadily toward the top of one of the peaks in the Mt Wilson area of the Spring Mountains. The pines made for great leaning posts for the folks that needed frequent rests. 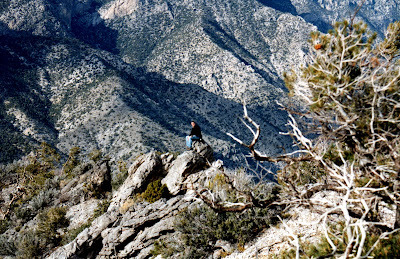 Rich takes a break sitting on a rock with a beautiful scenic overlook of the old Jeep trail we followed up the canyon. 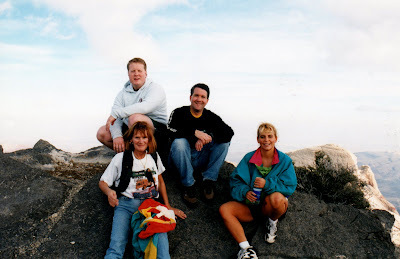 A summit photo of our hiking party (minus the photographer). 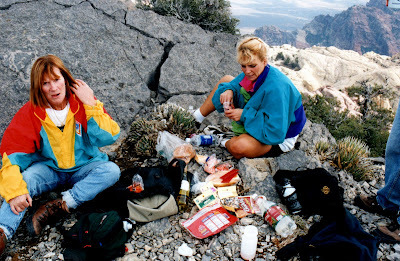 Everyone enjoyed lunch and a glass of wine on the summit with Las Vegas stretching out below us to the east. Sitting on the summit we could see that we had made a 3 or 4 mile loop around the summit on the old jeep trail and we could now see that if we bushwhacked straight down the north side of the mountain we would cut a couple of miles off the return trip. Sounds like a good idea! So with Rich and I leading the way we set off. 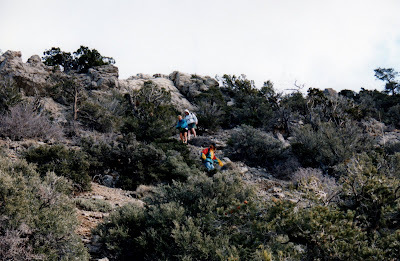 Here you see a couple of newbie hikers on their first bushwhacking experience picking their way down a mountain slope without the benefit of a trail. Soon we found our way back to the old jeep trail saving a few miles of trekking and an hour or so of time.